Conservative tax-and-spending goodies and promises of balanced books come at a time of renewed fiscal uncertainty for Ottawa in 2015. 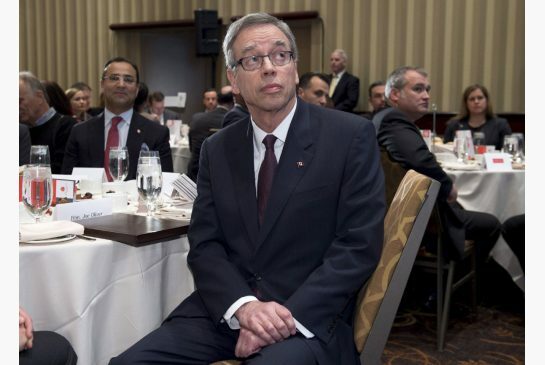 Finance Minister Joe Oliver has an escape hatch in his fiscal plan in the form of a $3 billion contingency fund, but even that may not be enough to avoid a deficit, economists say. OTTAWA—Prime Minister Stephen Harper’s government faces a roller-coaster ride in the coming months as it tries to balance Ottawa’s books and implement a lavish program of family-oriented tax cuts and spending in advance of an election. The Conservatives have been saying 2015 will be the year they end seven years of consecutive budget deficits and bring in billions of dollars worth of goodies for voters in keeping with promises made in the last election in 2011. But the linchpin of this strategy — running a budget surplus — has been thrown into doubt by the sudden, unexpected plunge in world oil prices. Depending on what happens to the always volatile price of a barrel of crude, the Harper government could find itself on the verge of an embarrassing slide back into a budget deficit in 2015. In the past four months, the government announced new spending and tax breaks that will cost the federal treasury about $5 billion annually, reducing the forecast budget surplus for 2015 to a meagre $1.6 billion. But world oil prices have continued to plumb unexpected lows. The economic impact of the global price shift will vary across the country but is expected to reduce the overall growth of Canada’s economy. And it will reduce the taxes that Ottawa collects, further imperiling Finance Minister Joe Oliver’s predicted budget surplus. Oliver has an escape hatch in his fiscal plan in the form of a $3 billion contingency fund on which the government can draw to keep from running a budget shortfall. But even with that extra $3 billion, the current level of oil prices will make it hard for the Conservatives to avoid a deficit in 2015, economists say. Harper said in early December the government is not concerned about the possibility of winding up in a budget deficit in 2015. He noted the estimates in Oliver’s Nov. 12 economic statement took into account the declining world price for oil. But Oliver’s calculations in the update were based on a price of $81 (U.S.) per barrel. At that price, the Finance Department calculated Ottawa’s revenues would drop by $2.5 billion a year. But since then, the price has plummeted to about $53 per barrel. If the price stays in that range, it could reduce the federal’s government’s budget surplus by another $2.5 billion a year, according to a study led by CIBC chief economist Avery Shenfeld. “Ottawa’s hit would be on the order of $5 billion” if oil prices stay down in 2015, CIBC economists concluded in a recent study. “While half of that damage was factored in to the last fiscal update, there’s a further $2.5 billion-a-year downside adjustment still to be realized, which would put a crimp into the room for any initiatives in the upcoming budget, or even force some yet-to-be-announced restraint,” CIBC says. If a budget deficit looms, the federal government might opt to keep its spending down with cuts to services of the kind that have angered veterans or forced Ottawa to hire 400 contract employees to deal with a wave of complaints about wait times for employment insurance claims. How this unpredictable scenario evolves will be crucial as the political storyline plays out in advance of the election expected in October. Pocketbook issues will be front and centre, with voters looking for responsible fiscal management coupled with pledges of new programs and services after years of belt-tightening. In the fall, Canada’s economy had been showing signs of considerable momentum, with unemployment down significantly to 6.6 per cent. But the economic outlook has been clouded by the oil price shock. What had been expected to be fairly strong growth in 2015 in the 2.5 per cent range appears likely now to come in at a modest 2.2 per cent or so, not enough to bring further improvements in the unemployment picture. On the wider strategic stage, the government’s central economic plan of sustaining long-term economic growth by expanding oil sales abroad remains in limbo with strong opposition to Keystone XL and other proposed export pipelines. The prospects of building new pipelines to carry oilsands-derived crude to export terminals became even more complicated in 2014, when, in the Tsilhqot’in First Nations decision, the Supreme Court of Canada reinforced the need to obtain natives’ consent for such projects. The Conservatives’ lack of action on their long-promised regulations to reduce greenhouse gas pollution from the oil and natural gas industry could assume new political importance. Harper’s response to climate change has drawn the ire of environmentalists all over the world, with some saying Ottawa’s approach has given U.S. President Barack Obama political cover to keep postponing a decision on whether to build the Canada-to-U.S. Keystone line. Jim Prentice, the former federal environment minister who is now Alberta premier, has been critical of his former boss’s approach to the environment, and Harper appears to be trying out a new line in advance of the election. In a year-end interview with CBC, Harper praised Alberta’s carbon-pricing scheme, saying “it’s a model on which you could go broader” to create greenhouse gas controls on a North American basis. Harper’s move in recent months to announce tax goodies and new spending on families worth $5 billion a year may have been premature, given the impact of crashing oil prices. But it still had the effect of leaving Ottawa’s fiscal cupboard bare — thus making it more difficult for the NDP and Liberals to trot out expensive new promised social programs in advance of the election. Most prominent among NDP Leader Thomas Mulcair’s policies is a national daycare plan, cost-shared with the provinces, that would set Ottawa back $1.9 billion annually as of 2018. To help pay for it, the NDP would partly roll back recent Conservative cuts to corporate income taxes. Liberal Leader Justin Trudeau says if in power he would cancel the income-splitting tax cut announced by Harper. The plan, which would cost Ottawa $2 billion a year in foregone revenues, has been widely criticized because it would benefit only 15 per cent of families, mainly those with one breadwinner in a high income-tax bracket. The savings would be used to pay for economic growth projects, education and other programs Trudeau says would benefit middle-class Canadians. The Federal and Ontario Governments can suddenly find dozens of Billions of Dollars if they just opened their eyes to the Fas.cist Ontario and Federal Gender Superiority Program that promotes Domestic Violence and murder by women towards fathers. Ontario spends Billions of Dollars on its Fas.cist "Mother's Aid Society" around 2 Billion dollars is spent largely providing Free Legal Services for Violent Female Child Abusers and violent women who assault Fathers. Ontario Spends around 10 Billion Dollars a year promoting Domestic Violence by the 75% of Police Budgets spent almost entirely on promoting violence by women towards men. Then there is the Billions of Dollars spent on the Family and Criminal Courts as a direct result of the Fas.cist Program of Gender Superiority that destroys children and creates an intergenerational problem of Female upon male violence. A classic example is that of Rotten Ottawa Police Detective Peter Van Der Zander who Fabricates Evidence NOT to charge the most violent of female child abusers and father abusers. Perhaps the greatest insult to Canadians is the financial cost when Police have NO accountability. But there is another greater insult, its the Insults to Justice called the Judiciary of Ontario who habitually fabricate evidence themselves after decades of doing the same while previously working as lawyers for the Unaccountable Criminal Cartel of Children's Aid Societies of Ontario that cost taxpayers Billions of Dollars. No, Harper does not get it, neither does Justin Trudeu who is a political flip flopper devoid of any interest in the Rule of law or abuse of children by the CAS in Ottawa where he lives.